Two good (and very related to one another) features from the June 14 issue of Sports Illustrated. 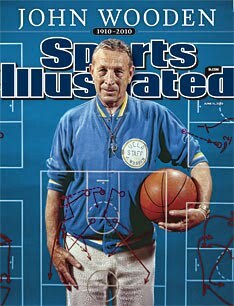 The cover story from Alexander Wolff is "Remembering The Wizard" about coaching legend John Wooden who recently passed away at the age of 99. I've been extremely partial to anything Wooden after receiving a card in response to a fan letter some 10 year ago, but also found Wolf's piece to be really well written. If one of the aims of good prose is to impart something new and interesting to the reader, this was very much accomplished in the SI story. Fascinating stuff within about both the coach's devotion to his wife who passed in 1985 and the author's role in convincing Wooden after her death to reengage with the sport of basketball that valued him so much. 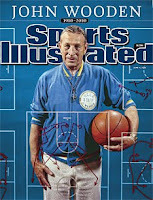 Thinking of Wooden as someone who tried to impart life lessons rather than just basketball coaching (which isn't a stretch at all if you consider his Coach Wooden website), I'd surmise that he'd approve of the actions shown by the subjects of the a different piece in this SI issue. "A Different Kind Of Perfect" is written by Tom Verducci and about MLB umpire Jim Joyce and Tigers pitcher Armando Galarraga. I posted about it previously, but the actions of these two men were remarkable in their approach to a very unfortunate situation (caused by Joyce) and seemed very much in line with some of the maxims that Wooden taught.